We are proud to announce the launch of our hkclubbing.com iPhone App which is available now as a FREE download! As the regions premier nightlife website since 1999, hkclubbing.com has an extremely loyal network of site visitors from Hong Kong and overseas interested in bars, nightclubs and restaurants in Hong Kong and Macau. The app contains a mobile version of the most popular website sections: Articles, Event Calendar, Photo Gallery and Venue Directory. 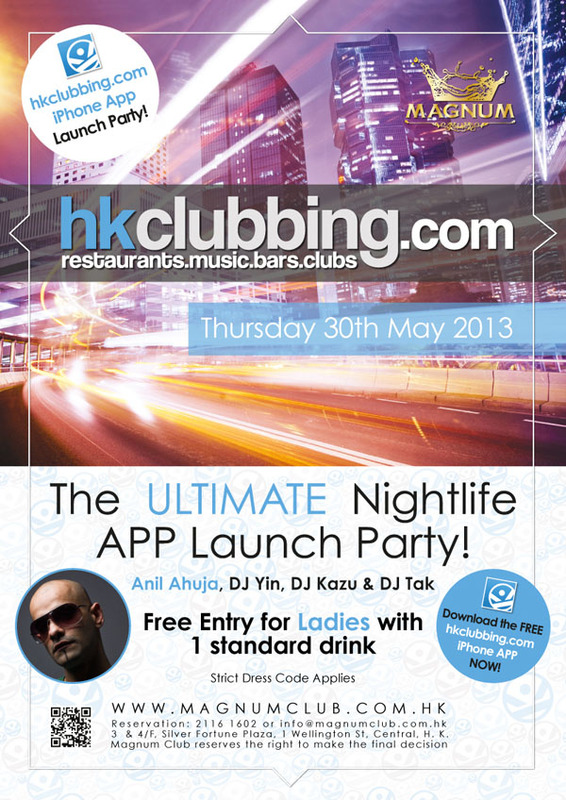 On the 30th May, hkclubbing.com will be celebrating the launch of its iPhone app at Magnum Club! We would like to see all of our fans there that have visited the site and have supported us over the last 13 years. Entry to this exclusive party is free before 12am, just show your hkclubbing.com app at the door to receive free entry for you and one lucky guest. Please visit https://itunes.apple.com/hk/app/hkclubbing/id618068161?mt=8 to download your free app now! Dress Code is strictly applied. Magnum Club reserves the right to refuse entry. Anil began his DJing career in the UK in 1996 where he resided for 3 years. He moved to Hong Kong to continue his career and has established himself as one of the most loved DJs throughout Hong Kong's club scene. Anil finds that DJing is creative outlet, where he can create the atmosphere on the dance floor and is able to transport people into his own world of beats, rhythm and sound. Anil has a very busy weekly schedule and he has performed at all key nightclubs such as Sugar, Club Aura, Cliq, Club JJs (Grand Hyatt), Tribeca, Q97 and Evisu Bar, Beijing Club, Club No. 9, Billion, Magnum, FLY, PLAY and many more. Anil was the official DJ for the Lady Gaga Pool Party (in Macau) and supporting DJ for many remarkable artists including Brass Knuckles, DJ Craze, Misty Rabbit, Goldie, Skream & Benga, Craig David, Tittsworth, Lil’ Jon, B.O.B., Benny Benassi and DJ Earworm. Now with a successful track record of over 15 years as one of Hong Kong’s most followed DJs, Anil has continually allowed his skills, as well as his creativity to reach unimaginable places. Anil's music collection and knowledge of the years is extensive and is able to DJ from clubs to cocktail parties. With the club scene booming in Hong Kong, the demand for his unique performance and interaction with local audiences has been phenomenal.